Mountain Fresh Grocery carries a great variety of wonderful cheeses. Lunch at Mountain Fresh Grocery in Highlands, North Carolina, is always a special treat! They offer a plethora of delicious dishes to tame your hunger or “hangry.” Choose from juicy grilled burgers and sandwiches—or specialty dishes like grilled chicken with pesto and Greek yogurt spread on flat bread, southwest grilled chicken salad, baby back ribs, shrimp poboys, sautéed crab cakes or a juicy Lucy burger. The hand-cut fries and chips are all made in house and the coleslaw is scrumdiddlyumptious! You can also enjoy a wood-fired NY style pizza or pasta with your choice of sauces and toppings—the pesto with chicken on angel hair pasta is a personal favorite. If you still need more to choose from try the salad, soup, pasta and pizza bar—yes, they probably have whatever your little heart desires. Enjoy a glass of wine or a mixed drink from the wine bar and finish off with dessert fresh from the bakery. They offer dinner for two to-go Monday-Saturday, a potato bar in the evenings and a large selection of freshly roasted coffees and espresso. 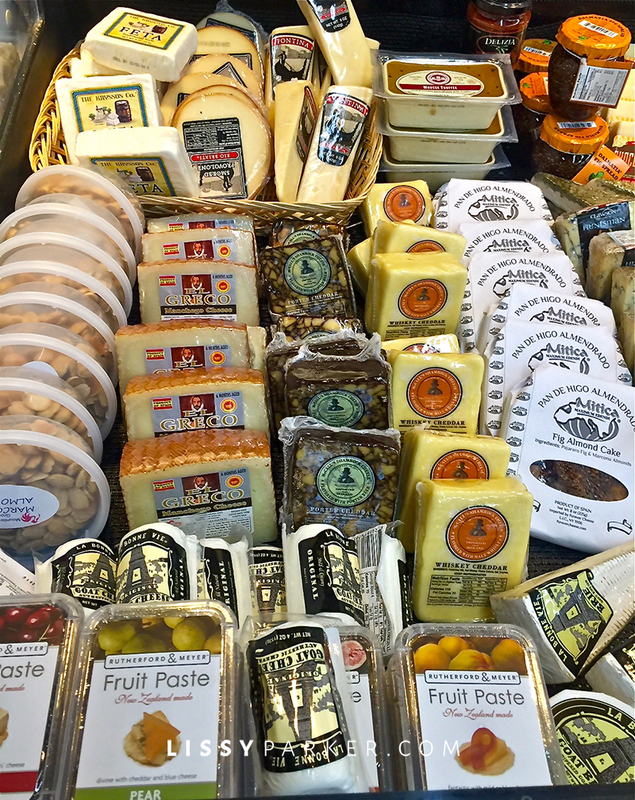 If you still need encouragement to check it out, know that you can pick up a variety of specialty cheeses and accoutrements—and you may choose from a large selection of wine and artisan beers for those fun-loving, drop-in guests. Enjoy your lunch! Or choose the wood fire pizza or the fresh pasta! And a soup and salad bar. I chose the special of the day—grilled salmon salad. The cupcakes were staring me down—there was a whole case full of colorful treats. Their baker turns out loaves in many flavors and sizes. Doughnuts and croissants tempt your taste buds. There is even a coffee roaster at work. Choose a flavor to go with that doughnut—Mr. P. says they have the best coffee in town! There is a wine bar for a glass or two or have one of the special lemonades. J. D. or Marilyn will help you select that special red or white—they know their wines. My favorite section is the Rose for summer. There is always a wine that is on Special for the week. There is a ever changing selection of fish. Steaks and meats are ready for the grill! Or the freshly made pizzas ready to go home with you. J.T. is the energetic owner of this Highlands ‘must see’ destination. Sooo good to know that they have pizza by the slice! I was hoping they would add that :). Also their coffee is amazing. I always buy a bag of the beans and bring them back to Atlanta :). I always get a slice of their Coconut Cake as a take out. It’s my late night ‘snack’ spread out over three evenings!! !